120 Volt or 230 Volt? Either choice is a winner! The Vapor Rino 145 is king in the both the 120 volt and 230 volt all electric dry vapor, commercial steam cleaner class. No matter which unit you get, you are getting the best of the best. Maximum PSI is exactly the same in both units. That said the units perform differently. The 230-Volt has more than TWICE the output of the 120V. The 230 volt is also designed to handle a HUGE 26 foot long main steam hose NOW INCLUDED! The 120 volt is only designed to work with the standard 12 foot hose. We now have a converter available that lets you turn two 115V household outlets into 230 Volts instantly. See Instant 230 Volt Converter here. Of course you can install a 230v outlet at your location or just use a generator & go 100% Mobile! The "Magic" Box: Lets talk about this converter for a moment. All the power of a 230 volt Rino off of two 115 Volt Outlets??? Our unique light weight converter essentially allows you to run our 230V Vapor Rino's on standard house hold 115 or 120 Volt outlets! Amazing but true. By plugging into two independent outlets you can combine one 115V outlet to another 115V outlet and get 230 Volts instantly. Our systems make having and using a HIGH POWERED STEAMER Easy. 230V = 3 Times the power! The added power of the 230V system means it can handle a LONGER HOSE up to 26 feet long. The 230 volt system heats up time 3 times faster then the 120 Volt and it has about 8 times the recovery rate of a 120V! More below. A simple rule of thumb is this: If you have or can get a place to plug it in, I would get a 230V Vapor Rino Vapor Steam System any day. If you can arrange to have an outlet installed or if you have a strong enough generator (4,500+ running watts) OR if you are using our instant 230V dual cord device strongly consider getting the 230V version. If you can plug it in it is usually worth it. Because of their raw power our 230V units are very popular among professional users. See the 230V Rino page for more information. The 230 Volt version is truly an amazing commercial vapor steam cleaner. With almost three times the overall vapor steam output than the 120 Volt version, the 230V, 145 PSI Vapor system is sure to impress. If you have ever worked with an all electric 120 volt vapor steam cleaner of ANY brand one of the first things you notice is that the pressure drops quickly during use. There is no way a 120 volt, all electric, vapor steam cleaner can keep up with steam production like a 230 volt can. All 120V, all electric vapor steam cleaners on the market drop down in pressure during use. That doesn't mean they are not good machines, it simply means they just dont have the same staying power. This is normal for a 120V system. The all electric 230V generates about 3x the steam and can maintain from 80 to 110 PSI during normal use use and has a very fast recovery rate. Quick Definition: My location has 220V not 230V, what do I do? Great question. In the USA, there is a common voltage range that all means basically the same thing. Devices made for 220V are good plugged into 220V. 230V or 240 Volt outlets. Its a lot like our standard household voltage most commonly called 120 Volts. This class typically ranges from 110 volts to 120+ volts. So, if you have access to, or can get access to a 240V outlet, 230V outlet or a 220V power source, no worries, you are good to go. • Warm up time is only about 15 minutes. • Recovery time is about 4 minutes. You can plug a 120 Volt Vapor Rino into any standard American outlet. So, if you're at your mom's house or at the office, no worries. Just plug it in, warm it up and get to work. There is no doubt that the 120 volt version is very convenient. Warm up time from ice cold to ready is about 15 minutes. The 120 Volt version will produce the same peek 145 PSI pressure as the 230 Volt version but it will not maintain as much steam or recover as fast during use. Recovery time on the 120V is about 4 minutes. Other then the power and steam generation difference, the machines have the same basic features, come with the same accessories (except for hose length), and are the same size and shape. • Warm up time is only about 5 minutes!!! The 120v takes 15 min. The 230Volt Rino maintains around 80 to 100 PSI even after 5 minutes of normal use! Let go of the trigger and about 30 to 60 seconds later you have full recovery to 145 PSI • Recovery time is only about 30 to 60 seconds!! That is about 8 times the recovery rate of the 120 Volt system. The 230V system can handle a LONGER STEAM HOSE up to 26 feet long INCLUDED. There are really no cons to the 230 except one. So let's address that now. The only down side to a 230 Volt Version of the Vapor Rino Commercial Vapor Steam Cleaner is that you have to have access to a 230 Volt outlet. It's that simple. You can use a generator (see generator section) or your shops 230 volt outlet. You can also have an outlet installed at your location. Having an electrician install a single outlet is usually very inexpensive. You may also consider our instant 230Volt device shown here. See our generator info in the FAQ or Common Questions section of this page for more on picking a generator. Do Not use a under powered generator . Make sure you pick the right size and it has the right outlet. 230 Volt PROS: Power, More Power and did we mention power? Oh yeah, and a maximum hose length of 26 feet! Yep, it is a simple choice if you have the ability to use it. 230 Volts is simply the best option if you want maximum steam generation power. Also, the heat up time from cold to hot is only about 5 to 6 minutes rather than 15 minutes, recovery rate is 30 to 60 seconds as opposed to 4 minutes with the 120 volt Vapor Rino. As you can see from those numbers, we are talking about at least 3 times the steam generation capabilities. Welcome to the 3 in 1, 145 PSI Vapor Rino Steam System: 2018, America's Most Exciting all electric Eco/ Environmentally friendly, low water use low water use 120 Volt, or extreme power 230 Volt 15A, All Electric, mobile steamer with detergent injection and extraction capabilities. What makes the 3 in 1 120Volt version more attractive to some users then our 230 volt unit? Only one thing really, ease of powering it up. Simply plug it into pretty much any standard USA household power outlet. From moms house to the work place the 120V is easy to plug in & fire up. You can also go 100% mobile with a generator. With water usage ranging from ONLY 1 to 3 gallons of water PER HOUR you will never again be stuck lugging around large water tanks. 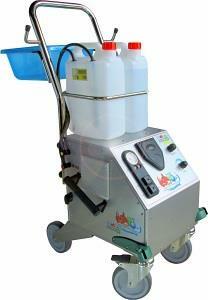 This system can be used 100% mobile or stationary in your shop or for cleaning your home or restaurant. 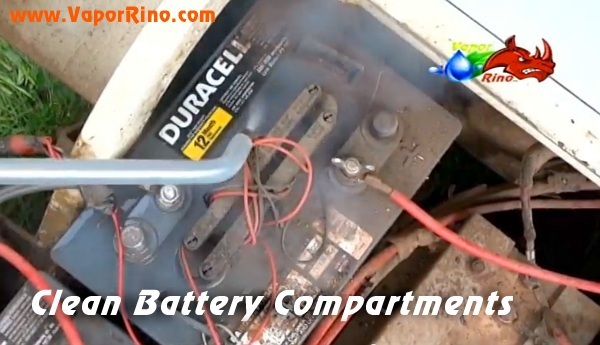 Going from job site to job site is a snap with the ultra portable 120 volt 3 in 1 Vapor Rino. If you want more consistency of power, & significantly greater productivity see our powerful 230V version here. Firing up a 230V Rino is easier then you might think. 230V = Max Power = maximum performance. Vapor Rino has done it again. Revolutionary! Now introducing the 3 in 1! 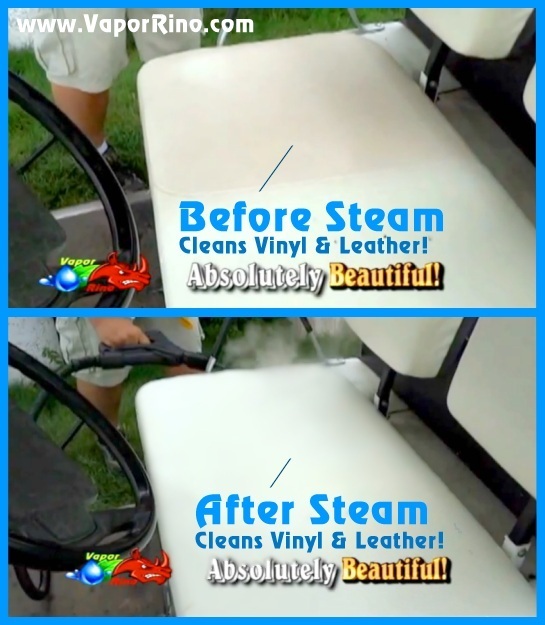 #1) It’s a 95% dry commercial vapor steam cleaner, #2) it’s a wet hot water and hot soap injected steam cleaner & now #3) it is a wet or dry steam upholstery extraction powerhouse! 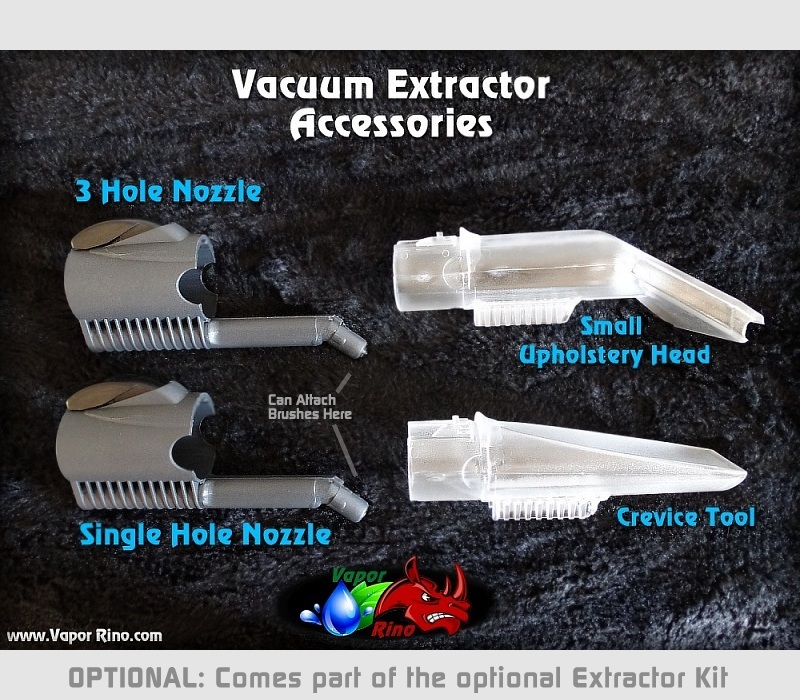 Just plug your shop vacuum (or other suction source) into the back of the unit & with our optional 7 pc extractor kit you have a full-fledged automotive carpet spotter / automotive detail upholstery extractor! Super heated steam & hot water just does it better! Unlike others our unique design has NO complex integrated circuitry & no overpriced replacement vacuums! If your vacuum ever burns out just run down to your local hardware store & get another! Simplicity, beauty, Vapor Rino! From tile & grout, restroom cleaning, mobile car washing to interior detailing of cars, Vapor Rino has you covered. See our new 3 in 1 video on this page! See Extraction Kit. Thank you very much for visiting. We are so excited about the Vapor Rino. Though I know I should keep this all positive, the phrase 'it's about time keeps coming to mind. Seriously, this has been decades in the 'wanting'. Finally, a true commercial quality steam cleaner with a real heavy duty feel that offers truly high maximum PSI. We have never seen an all electric, 120 volt / 15 amp portable vapor steam cleaner with 10 bars of pressure (that means 145 PSI) with chemical injection sold in the US or Canada and we have been in this business for a long time. We are told that this is the most powerful commercial vapor steam cleaner ever built for production in a 120 volt 15 amp version anywhere as of 2014. This power house can run off of a standard household outlet! That means anywhere you have power in the US, you can run this machine! So you can easily plug it anywhere! 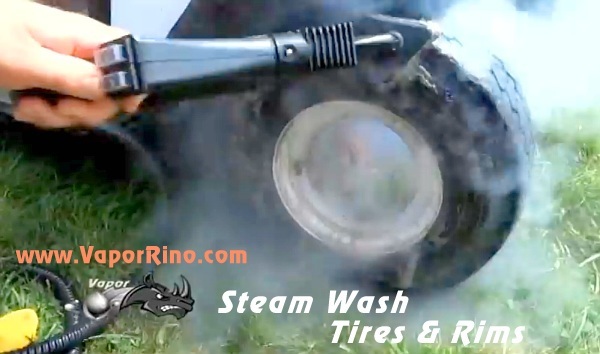 Whether it be at mom's house, the office, a job site or washing cars in the middle of a parking lot using a generator, the Vapor Rino has you covered! This new Vapor Rino is truly Canada & America's Most Powerful all electric, chemically injected, 120V, 15A commercial vapor steam cleaner you can buy anywhere in the US or Canada for any price as of right now! Overview: Before I go on, let me summarize the primary features. Maximum pressure of 145 PSI (10 Bars), 120 Volts, 1750 Watts / 15 Amps (also see the 240 Volt Version Here) 95% dry vapor steam output PLUS a hot chemical / hot water injection system WITH adjustable solution flow control. The Vapor Rino Commercial steam cleaner also has a 100% adjustable steam flow, built in cart, accessories basket, hangers, locking rubberized 5" wheels, and the largest and most commercial steam cleaner accessory kit we have ever seen. Don't forget the detachable / replaceable extra long steam hose and hangers for your hose cord or squirt bottles. Update: also now including an extra chemical injection bottle. This allows you to swap between your favorite chemicals or simple water for the injections system in seconds! Update: also now including horse hair brushes! These fine soft bristles are great on upholstery, leather, hard surfaces, painted surfaces and much more. 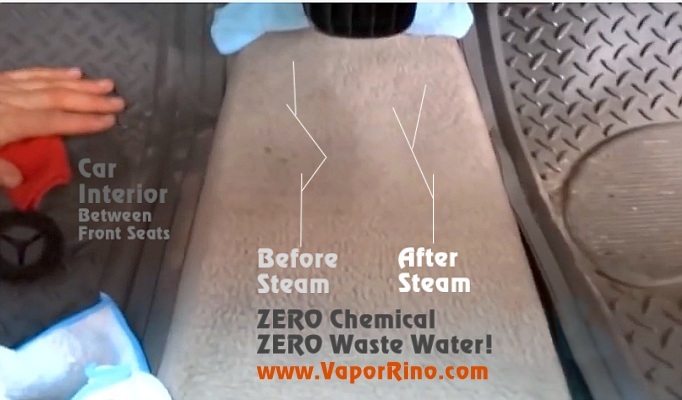 All in all the Vapor Rino VR145 Commercial Steam Cleaner is simply an amazing vapor cleaning system. So let's break all this down. We will discuss these features below one by one. Very Impressed: I have one of these beautiful Vapor Rino systems sitting next to me right now as I write this and I have to say,,, wow! Solid looking, solid feeling right out of the box and what a great head of steam! I can't wait to get my hands on a 240 volt version we have in production. Either way, this is now my favorite vapor steam cleaner of all time. There is no doubt in my mind if I were back in my contracting days what machine I would purchase. In 20 years of working with and dealing with commercial vapor steam cleaners I have never been this impressed. Size and Weight: So let's talk a bit about our industrial quality commercial vapor steam cleaner, the Vapor Rino. First, it weighs in at right around 49 lbs with water. That weight does not include accessories. With handle it stands about 36" with a low width profile of only about 16". This low profile means it's easy to roll through doorways, move around your building and easy to store. 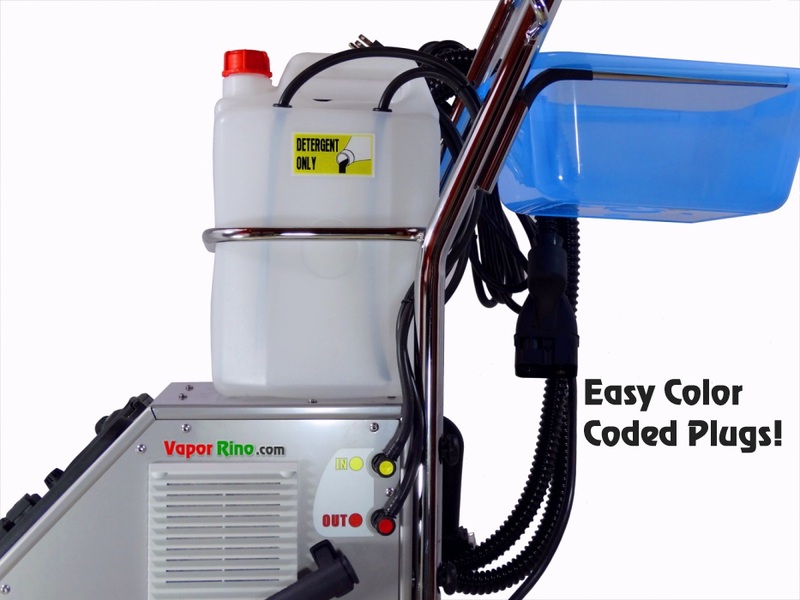 Integrated Cart: The Vapor Rino Commercial Steam Cleaner has an integrated cart with an easy to remove and replace handle system. The handle attaches solidly with NO tools and the chemical and water reservoirs detach by simply unplugging them from the side of the machine and lifting them out. This removable handle might be useful for the contractor that needs to fit the machine into a tight space like the back seat or trunk of a car. The plugs are color coded and labeled so it's a piece of cake to be sure you are connecting everything exactly right. The cart also features a basket for your accessories, cleaning products, rags, or your lunch! The stainless steel rack also features two hooks, one on each side. These are perfect for hanging your steam hose and cord when not in use. These hooks are also great for hanging squirt bottles or hanging a rag between uses. A perfect setup for the mobile carwash, mobile automotive detailer, cleaning contractor or janitorial service. All you do is put on the wheels, fill it, plug in and get to work! 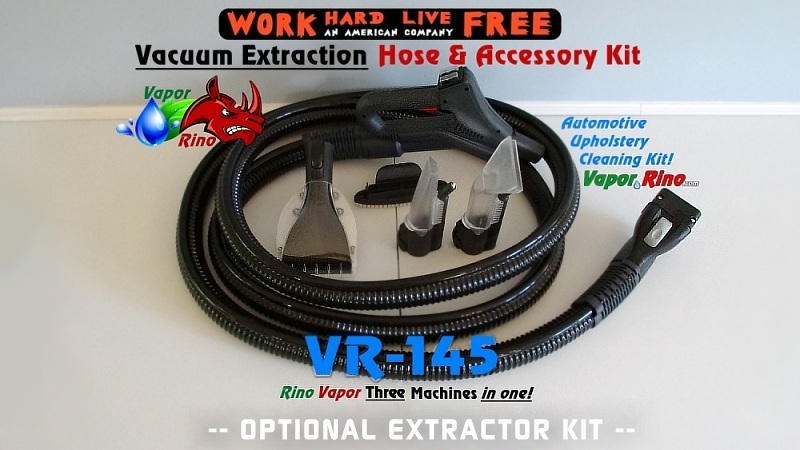 Hot Chemical Injection: The Vapor Rino heavy commercial steam cleaner comes with a powerful hot detergent injection system that is activated right from the gun. The detergent goes into one of the two jugs on the top of the unit. See pictures. This bottle can be filled with your favorite cleaning solution. Cleaning products like grease busting Dawn or Ajax liquid dish soap mixed with water. Detergents purchased from the hardware store. Just nothing flammable, corrosive or explosive. You can fill the chemical jug with Windex, detergent, bubble gum remover, sanitizing agents or degreasers. Apply hot wax to cars! Add a Zip Wax solution or other wash and wax or automotive carwash solutions and instantly you have a hot wash and wax carwash system! Of course, this same principle goes for many other cleaning products. Steam is great, but steam and detergent is the ultimate grease fighting combination. Perfect for commercial kitchen cleaning, restrooms, dorms, restaurants, bars and much more, sanitation and even bedbug control. water injected commercial steam cleaner. This a is powerful feature used in many industries. cleaning solutions in a matter of seconds. You can keep one jug filled with water for hot water injection and swap it out anytime for your favorite cleaning fluid. Order more jugs and you can have a large assortment of cleaning solutions in your truck ready to use at a moment's notice! Total Control: The hot detergent / hot water injection system is totally controllable! That's right, FINALLY,, a vapor cleaner with a flow control on the injection side. No more wasted soap! 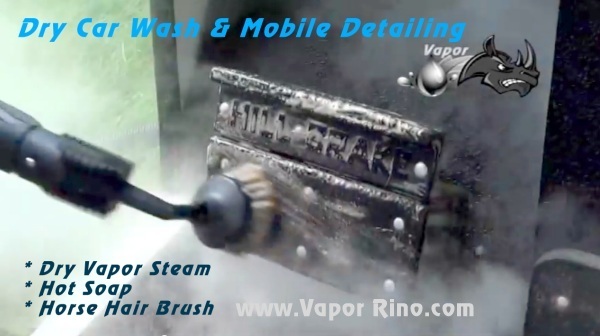 You can turn the knob on the front of the Vapor Rino commercial steam cleaner easily adjusting how much soap or water gets mingled with your steam output. If you want a super rich soap solution crank it up. Want just a little bit of soap in your steam flow, turn it down. Totally adjustable. Control is power! No more wasted detergent and no more over wetting a surface or putting out too much cleaning solution. YOU decide how much comes out! By the way, did you catch that you can activate the injection system with a flick of your thumb right from the steam gun? Gone are the days of climbing out of a car or work spot, walking across the room just to turn on the injector on the machine. Now it's activated from the steam gun on demand when you need it. If you can move your thumb, you can activate the injector. Nice! Like control? Well who doesn't, right? 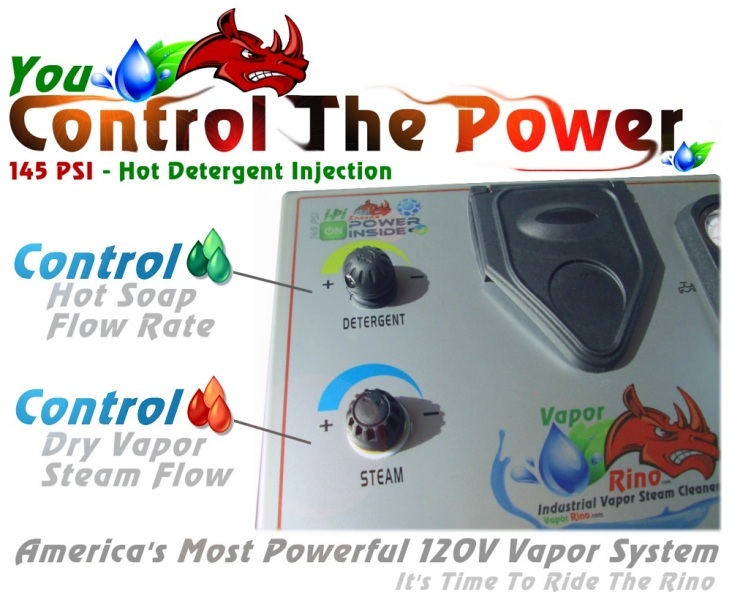 With Vapor Rino you also get to have 100% control over your steam flow output! Want maximum steam output, crank the dial up all the way. Want a slower flow, lower it. From off to 100%, YOU DECIDE! Locking Coated Heavy Duty Wheels: I was surprised by the wheels. That's right, the quality actually extends all the way down to the wheels! First of all, they are clearly heavy duty. This is not some cheap Chinese add on part. This is first world workmanship! The wheels are dual layer with a solid core. NO FLAT TIRES! The outside of the wheels are coated with a chemical resistant soft rubberized coating. Makes for smooth movement across tile, asphalt and even rugs. The wheels both front and back are 5" tall insuring easy rolling over reasonably rough surfaces. The rear wheels are mounted on a heavy duty C frame stainless steel bracket. See pictures. This is truly rock solid craftsmanship. The Front Wheels: The front wheels have a heavy duty set of castors. Now when I think castors, I often think of the little plastic ones found on other steam cleaners on the market. This is not the case here. These are heavy steel and very rugged smooth rolling and smooth spinning wheels and castors. See pictures. The front wheels feature a sure grip foot lock system. Both of the wheels lock and when locked this baby is not going anywhere! Side note about the wheels: I noticed the front wheels lock in any position but when they are angled back they not only lock the rolling action of the wheel but they also lock into a groove that prevents the castors from spinning as well! Either way you use them, this is true fine craftsmanship at its best. The Pressure Gauge: The Vapor Rino 145 PSI Commercial Vapor Steam Cleaner also has a solid state analogue pressure gauge. This is not some cheap digital gauge, but rather the real deal. Industrial users want quality, and quality is what you get. The gauge reads in both European standard Bars and USA standard PSI. This is nice as many of the other systems out there only read Bars or only PSI. There is a set of heavy duty buttons on the front. One activates the power, the other activates the boiler. Accessories: The unit comes with a large load of high quality accessories as well as a replaceable steam hose. The hose is about 11.5 feet and the power cord about just under 13.5 feet long. Of course you can use a heavy duty extension cord. In doing so, you can extend your reach anywhere. Cooling Systems: Okay, there is one more really great feature to this unit that virtually all other systems on the market are missing. It has a built in cooling fan! Yep, it took two decades but finally someone has decided that the electronics should be cooled! Though electronic problems are not that frequent, there is little doubt that subjecting circuit boards, wires and connectors to such high heat day in and day out takes a toll. Now with the Vapor Rino 145 PSI heavy commercial vapor steam cleaner your electronics will be cooled! 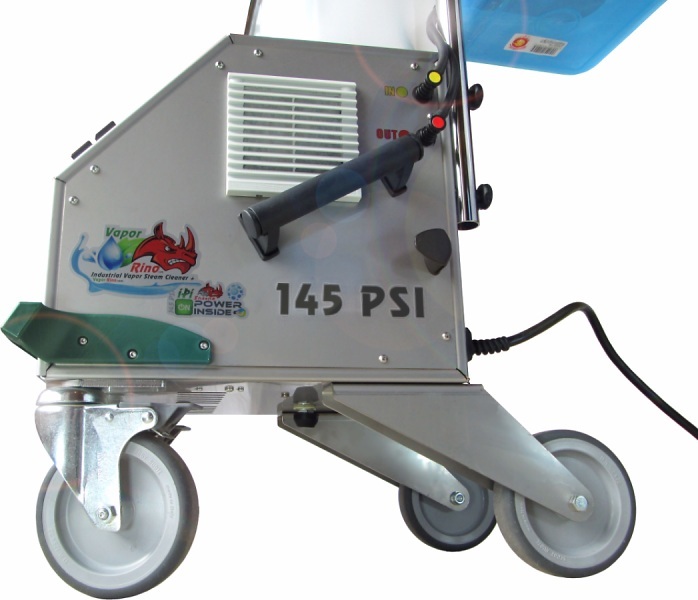 This ventilation rounds off this system as a true one of a kind professional vapor steam cleaner. The bottom line is this: The PSI alone takes the day but all these other features make it an easy choice. 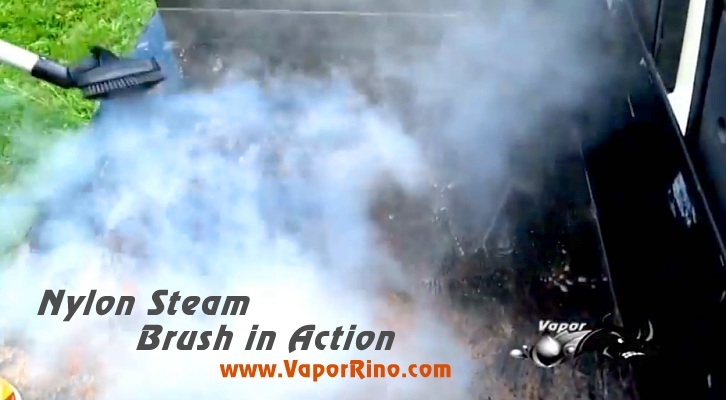 Vapor Rino is sure to quickly become the new King of the Vapor Steam Cleaner Jungle! 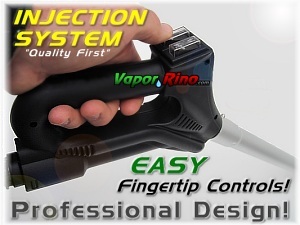 Two thumbs up and all the gold stars we can find go to this one of a kind precedent setting vapor system. Thank you Vapor Rino! Voltage: 230 Volts - Run off of a 20 Amp+ Breaker. Voltage RANGE: Another beautiful fact about the Vapor Rino® is that it will run on any voltage range from 215V to 250V so if you have something like 220V or anything in that range at your home or shop you are good. remote location use. You can also install a plug at your shop or use our converter! Generator Size: Stand Alone Rino, minimum 4,500+ continuous running watts. With a vacuum on at the same time 6,000+ continuous running watts. 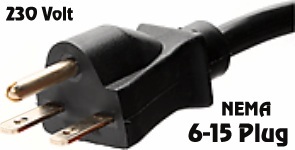 the Vapor Rino's 3 prong 6-15 plug type. Read our FAQ for more generator info. HOSES: Two Hoses Included Standard. Used one at a time. Having two hoses gives you many advantages. If one hoses ever gets damaged or run over you have a backup hose ready to go! Next, having an extra short hose on hand provides you with a super dry steam option. Longer = slightly damper, shorter = dryer. The long hose is fantastic for working around the outside of a vehicle as well as the inside. Great for cleaning a restroom, kitchen, janitorial work and more. The long hose really free's up your range of motion. It is indeed, a game changer. The short hose is ideal for applications where you want as dry and hot of steam as you can get. Only Vapor Rino provides you with both options INCLUDED in the standard kit. Long hose not recommended for the 120 Volt Rino. 26 Foot Main Steam Hose Included: 26' Detachable & Replaceable Steam Hose. ONLY AVALIABLE with the 230 Volt Vapor Rino. The long hose provides massive reach with a little wetter steam. This super long main steam hose allows you to move freely around a vehicle or job site greatly reducing how often you move the base unit. Vapor Rino’s new 26-foot-long main steam hose is truly a game changer. Just park Rino in the front of a car or job site and get to work. Great for hundreds of applications! For dryer applications use the other included short hose! 12 Foot Main Steam Hose Included: 12' Detachable & Replaceable Hose. This short hose provides the driest steam possible for those special applications. If you need it extra dry, just plug in this INCLUDED extra, approximately 12 foot long main steam hose. Water Usage: Only approximately 2+ GPH (Gallons Per Hour) 230V unit has a greater output than the 120V version. May vary depending on use. Injection Mode ON: Uses approximately 4.5+ GPH (Gallons Per Hour) total! That includes steam usage. May vary depending on use. Output Mode #2: Hot Chemical or Soap Injected into the Steam Flow - Fully Adjustable Injection flow - can activate on demand at ANY PSI range! Operation Mode #4: Deep Upholstery Extraction (Requires Upholstery Kit) just attach your own shop vacuum or old extractor and go to work! Gun Activation: Both Steam and Injection Features are easily Activated from the Steam Gun for on demand use at ANY PSI range! without shutting down. Even add water while working. Heating Time: Approximatlly 5 to 6 minutes from cold to ready to steam running at 240 volts. Results may vary with lower voltage imputs. Consistent Output: Even after 5 minutes of typical steaming, output typically remains around 80 to 100+ PS! Results may vary during usage and depending upon actual power/voltage into the unit and how you use the tool. The bottom line, the 230 Volt Vapor Rino gives you MUCH more working power than a 120v. Typical Recovery Time: An amazing 30 to 60 seconds to FULL Recharge even after 5 min of typical use! Internal Boiler Tempature: Over 300 Degrees F.
Mobile Unit: Yes. Unit is on wheels and has a collapsible handle. 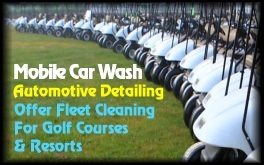 * AUTO DETAIL PACKAGE: Includes Special wands & brushes for automotive detailers and car cleaning professionals. This is included in the 50 pc kit free! NEW NOW INCUDED: TWO HOSES instead of one. You now get FREE our extra long 26 foot main steam hose PLUS an extra 11.5 foot long hose! No extra charge! * JANITORIAL & OTHER CLEANING: Poles and attachments suited for hundreds of possible uses including Janitorial work. All this included in 50pc kit! 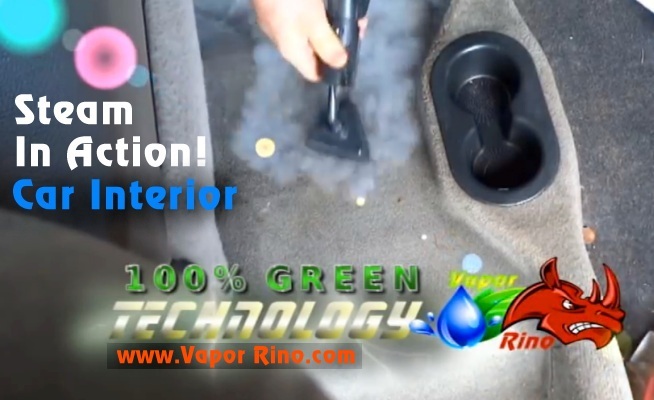 * OPTIONAL EXTRACTION PACKAGE: Our optional extraction package (see offer #2 or call) allows you to use the Vapor Rino as a steam upholstery and rug extractor for detailing cars. 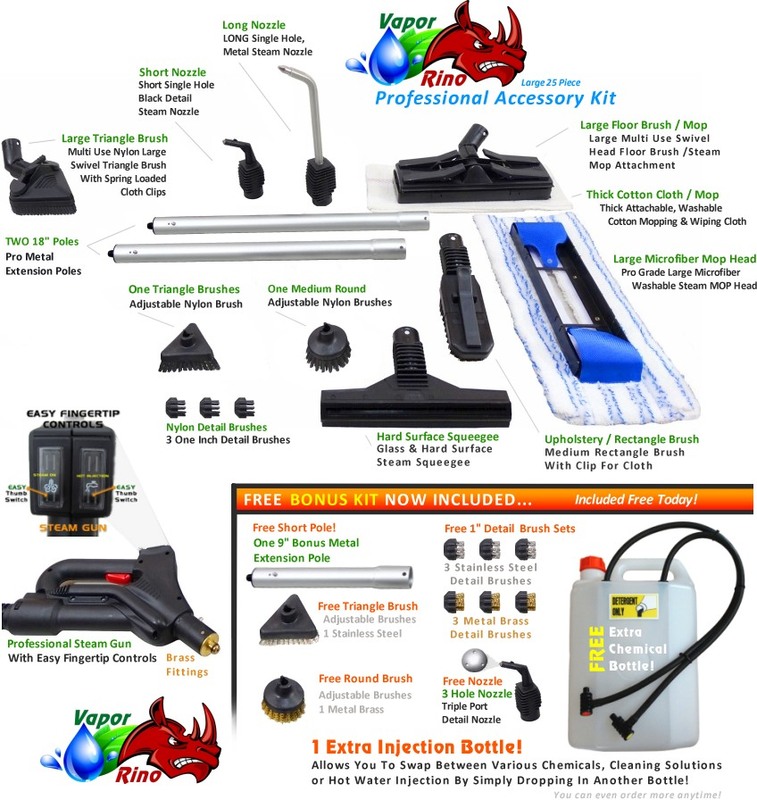 In short you get the world class, 230 volt Vapor Rino including intergraded cart and basket system, TWO steam hose/gun combos, our generous 50 pc accessory kit including automotive detailing tools. Also includes an extra chemical jug for swapping out different soaps or water for the injection system. This is a FULLY READY TO WORK SET. Just plug it in and add water! Keeping it simple so you can get busy doing what is important to you. Vapor Rino, work hard live free! PLEASE NOTE: This image only shows approximatlly 25pc. The NEW kit that you will receive has DOUBLE that number. You will receive the updated 50 pc kit with ALL orders. New images coming later this year. Thank you. The powerful 230 volt Vapor Rino commercial vapor steam cleaner gun comes with an easy push button design. The top button on the left turns the steam on. The top button on the right activates your hot water or chemical injection. All this without having to touch your machine or get out of the car you are cleaning. The Red steam button by your index finger is your stop and go button. Simply squeeze the handle and whatever option you have selected comes shoots out of the nozzle. At anytime, any PSI, just hit the switch of your choice like dry steam or injection, pull the trigger and bam,, you have on demand cleaning power. Truly an amazing portable steam cleaner! This easy gun activated push button operation is great for automotive detailing, janitorial work and much more. 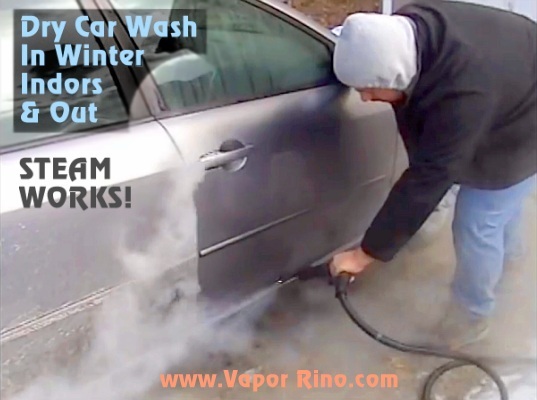 No more getting in and out of your car to activate your vapor steam cleaner features! 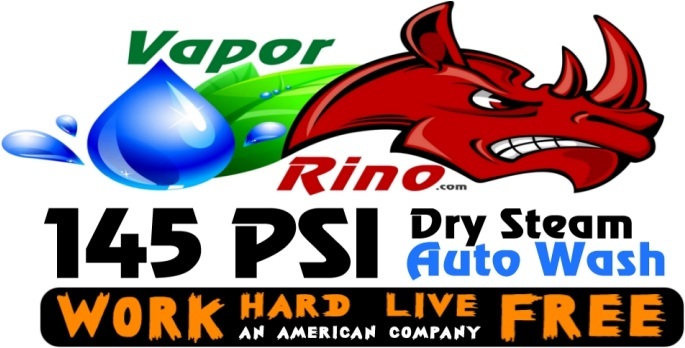 Vapor Rino systems make your job faster, more effective and easier then ever! 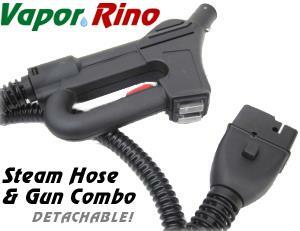 The 230 volt Vapor Rino comes with TWO HOSES! One 26' long and one approximately 12' long. Used one at a time both detachable hose and gun combos come standard as part of your FULLY READY TO WORK SET. 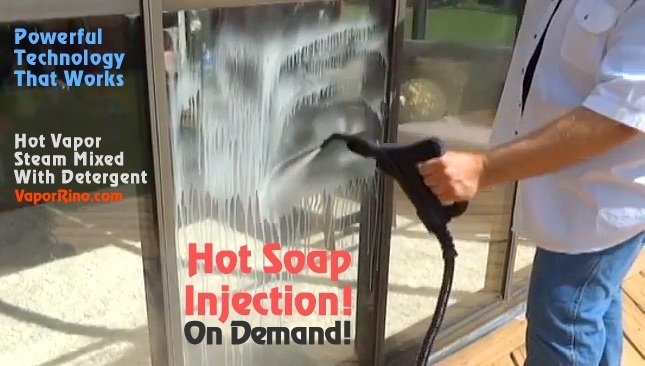 It is a heavy duty, easy to use tool with both steam and soap injection activation right on the gun. NOT All 50 pieces are shown in this image however the ones you see ARE included plus more! Voltage: 230 Volts - Running off of a 20 Amp+ Breaker (we recommend installing a NEMA 6-15/20R Outlet at your location) VOLTAGE: The Rino will run on any voltage range from 215V to 250V so if you have something like 220V at your home or shop you are good / OR use a generator! Generator Safe: Yes! Can be run off of a generator for mobile detailing or remote location use. You can also install a plug at your shop or use our converter! Generator Size: Stand Alone Rino, minimum 4500+ running watts, with a vacuum at the same time 6000+ running watts. Generator Outlet type: We strongly recommend getting a generator with a 240V 4-prong twist lock L14-30 Outlet. match the Vapor Rino's 3 prong 6-15 plug type. HOSES: Two Hoses Included Standard. You can only use one at a time. Having two hoses gives you many advantages. If one hoses ever gets damaged or run over you have a backup hose ready to go! Next, having an extra short hose on hand provides you with a super dry steam option. Longer = slightly damper, shorter = dryer. The long hose is fantastic for working around the outside of a vehicle as well as the inside. Great for cleaning a restroom, kitchen, janitorial work and more. The long hose really free's up your range of motion. It is indeed, a game changer. The short hose is ideal for applications where you want as dry and hot of steam as you can get. 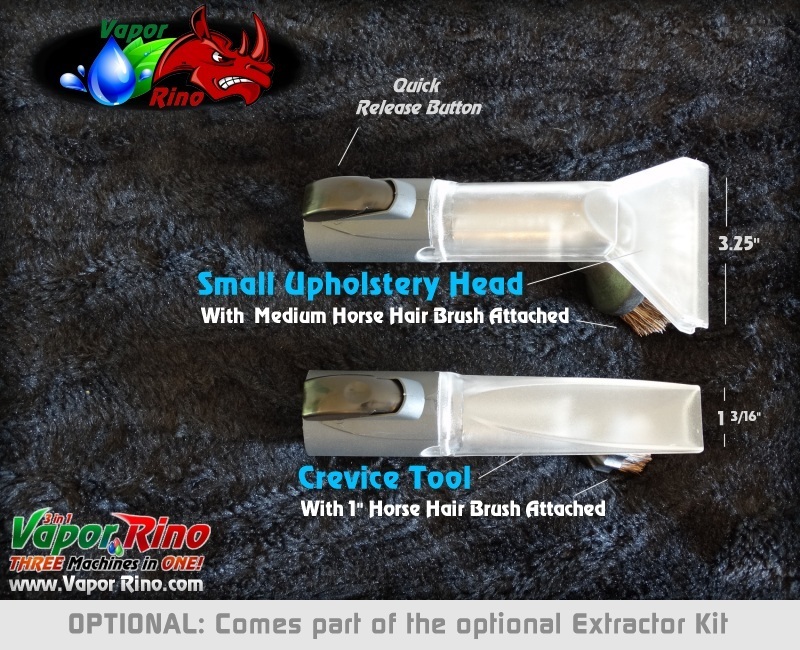 Only Vapor Rino provides you with both options INCLUDED in the standard kit. Long hose not recommended for the 120 Volt Rino. Non Stop Operation: Continuous - Meaning you can add water any time without shutting down. Even add water while working. Heating Time: Approximatlly 5 to 6 minutes from cold to ready to steam running at 240 volts. Results may vary with lower voltage imputs. Consistent Output: Even after 5 minutes of typical steaming, output typically remains around 80 to 100+ PS! Results may vary during usage and depending upon actual power/voltage into the unit. The bottom line, the 230 Volt Vapor Rino gives you MUCH more working power than a 120v. Either choice is a winner! The Vapor Rino 145 is king in the both the 120 volt and 230 volt all electric dry vapor, commercial steam cleaner class. No matter which unit you get, you are getting the best of the best. Maximum PSI is exactly the same in both units. That said the units perform differently. The 230-Volt has more than TWICE the output of the 120V. The 230 volt is also designed to handle a HUGE 26 foot long main steam hose NOW INCLUDED FREE! The 120 volt is only designed to work with the standard 12 foot hose. We now have a converter available that lets you turn two 115V household outlets into 230 Volts instantly. See Instant 230 Volt Converter here. Of course you can install a 230v outlet at your location or just simply use a generator and go 100% Mobile!. The "Magic" Box: Lets talk about this converter for a moment. All the power of a 230 volt Rino off of two 115 Volt Outlets??? Our unique light weight converter essentially allows you to run our 230V Vapor Rino's on standard house hold 115 or 120 Volt outlets! Amazing but true. By plugging into two independent outlets you can combine one 115V outlet to another 115V outlet and get 230 Volts instantly. Our converters make having and using a HIGH POWERED STEAMER Easy. Learn more about our 230V converter here. 230V = 3 Times the power! The added power of the 230V system means it can handle a LONGER HOSE up to 26 feet long. The 230 volt system heats up time 3 times faster then the 120 Volt and it has about 8 times the recovery rate of a 120V! More below. A simple rule of thumb is this: If you have or can get a place to plug it in, I would get a 230V Vapor Rino Vapor Steam System any day. If you can arrange to have an outlet installed or if you have a strong enough generator (4500+ running watts) OR if you are using our instant 230V dual cord device strongly consider getting the 230V version. If you can plug it in it is usually worth it. Because of their raw power our 230V units are very popular among professional users. See the 230V Rino page for more information. The 230 Volt version is truly an amazing commercial vapor steam cleaner. With almost three times the overall vapor steam output than the 120 Volt version, the 230V, 145 PSI Vapor system is sure to impress. If you have ever worked with an all electric 120 volt vapor steam cleaner of ANY brand one of the first things you notice is that the pressure drops quickly during use. There is no way a 120 volt, all electric, vapor steam cleaner can keep up with steam production like a 230 volt can. All 120V, all electric vapor steam cleaners on the market drop down in pressure during use. That doesn't mean they are not good machines, it simply means they just dont have the same staying power. This is normal for a 120V system. The all electric 230V generates about 3x the steam and can maintain from 80 to 100 PSI during normal use use and has a very fast recovery rate. Welcome to the 3 in 1, 145 PSI Vapor Rino Steam System: 2018, America's Most Exciting all electric Eco/ Environmentally friendly, low water use 120 Volt, or 230 Volt 15A, All Electric, mobile steamers with detergent injection and extraction capabilities. What makes the 3 in 1 120Volt version more attractive to some users then our 230 volt unit? Only one thing really, ease of powering it up. Simply plug it into pretty much any standard USA household power outlet. From moms house to the work place the 120V is easy to plug in & fire up. You can also go 100% mobile with a generator. With water usage ranging from ONLY 1 to 3 gallons of water PER HOUR you will never again be stuck lugging around large water tanks. 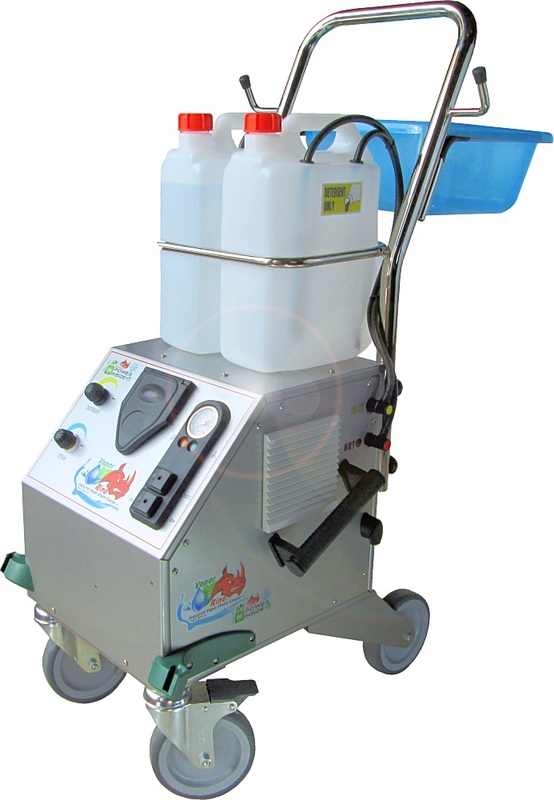 This system can be used 100% mobile or stationary in your shop or for cleaning your home or restaurant. Going from job site to job site is a snap with the ultra portable 120 volt 3 in 1 Vapor Rino. If you want more consistency of power, & significantly greater productivity see our powerful 230V version here. Firing up a 230V Rino is easier then you might think. 230V = Max Power = maximum performance. The 230 volt Vapor Rino commercial vapor steam cleaner gun comes with an easy push button design. The top button on the left turns the steam on. The top button on the right activates your hot water or chemical injection. All this without having to touch your machine or get out of the car you are cleaning. Offer #1: Includes our industry leading 50pc accessory kit and the 145 PSI, 230 Volt Vapor Rino ® - ready to work right out of the box. This 230V version has more than 2x the steam output to getting your jobs done faster. 26' Hose + an extra 11.5' Hose. 230V Rino is MAX POWER! If you can fire it up, this is the best choice. This is the REAL Industrial use, high quality Vapor Rino ® automotive detailing system + with all the bells and whistles. Full Ready to Work Set! If you want your business to excell, there is only ONE! You are looking at the REAL one and only, legendary, High Quality Vapor Rino® 145 PSI, 230 Volt All Electric Industrial Vapor Steam Cleaner featuring Soap injection & Optional Upholstery Extractor Kit. Auto Detailing (and more) Made Easy! 230 Volts means More Power! That means Faster Cleaning times resulting in Greater production. Ultimatlly, the Vapor Rino 145 PSI, 230 Volt Commercial Vapor Steam Cleaner saves you time and as the old adage goes, time is money! Vapor Rino, This changes everything. The One and Only High Quality Vapor Rino 145 PSI, 230 Volt All Electric Industrial Vapor Steam Cleaner. 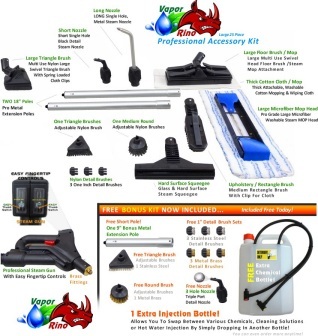 Auto Detailing (& more) Made Easy! The One and Only High Quality Vapor Rino 145 PSI, 120 Volt All Electric Industrial Vapor Steam Cleaner plus Upholstery Extractor Kit. Auto Detailing (and more) Made Easy! Offer #3 Learn about the Converter Here This is our one of a kind, instant 230V converter! Ordering as a kit here saves you money! Get it now and save.